We’ve covered the anime car (or itasha) phenomenon in Japan previously on Jalopnik East, and at the time we mentioned that actual automakers were getting in on it. 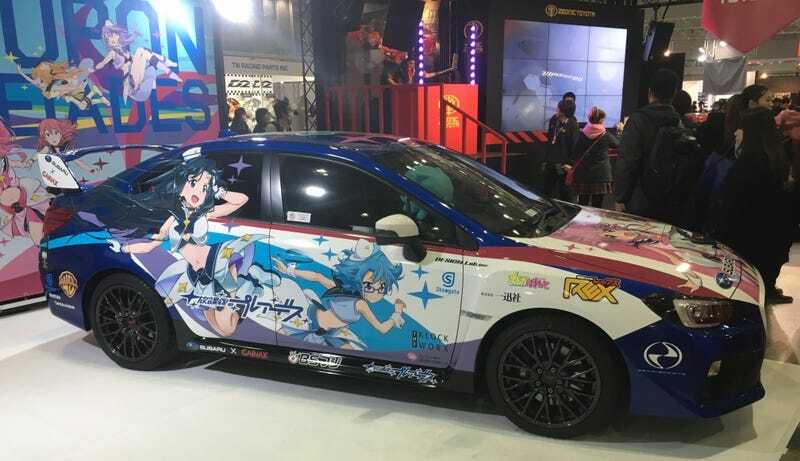 Well, Subaru partnered with famous anime studio Gainax (of Neon Genesis Evangelion) to produce an anime called Wish Upon the Pleiades (you know, Subaru = Pleiades). It had its own booth at TAS 2016. One day, a young girl discovers her best friend is actually a magical girl working to send an alien creature home. But he leaves out the most important parts: the girl’s name is “Subaru”—because branding—and the alien is called the Pleiadian, also because branding. It’s basically like Subaru decided it wanted its own Sailor Moon and it has enough money to hire one of the longest lived, highest awarded, and indeed, most iconic anime production studios to make one. So, you know, unsurprisingly, if it’s a Subaru project, it needs an STI. Here’s your Gainax STI. Me? I’d frankly prefer a KareKano (His and Her Circumstances) itasha, but, you know, nobody asked me.